Yokogawa has contributed to solving problems for customers across a wide range of industries. Our initiatives have done more than simply increase economic value generated by our customers. Yokogawa has contributed to solving social and environmental problems, including energy conservation, resource conservation, greenhouse gas reduction, improved safety, and other accomplishments that fall in line with the SDGs*. We work with customers expanding the view of their business, discovering and resolving issues as we journey to a sustainable future. In August 2017, Yokogawa released a statement on its aspiration for sustainability and established Three goals for achieving sustainability based on a low-carbon and circular society for future generations. Furthermore, in May 2018, the company set a number of sustainability targets for fiscal year 2020 and 2030 incorporating them into its mid- and long-term business plans for the evaluation of concrete steps that will be taken to pursue these Three goals through its business activities. Yokogawa will work to achieve net-zero emissions, make a transition to a circular economy, and ensure the well-being of all by 2050, thus making the world a better place for future generations. We will undergo the necessary transformation to achieve these goals by 1. becoming more adaptable and resilient, 2. evolving our businesses to engage in regenerative value creation, and 3. promoting co-innovation with our stakeholders. Yokogawa works with its customers to identify and solve problems over the entire range of their business activities, thus aiding them in their efforts to innovate and improve productivity. This activity leads ultimately to the creation of an abundant society. 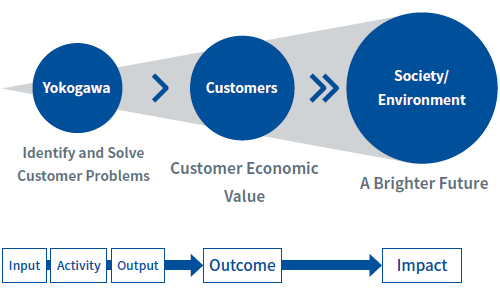 This process (Input → Activity → Output → Outcome → Impact) is what we call our Value Creation Story. We will achieve the Three goals by expanding and building on our Value Creation Story. 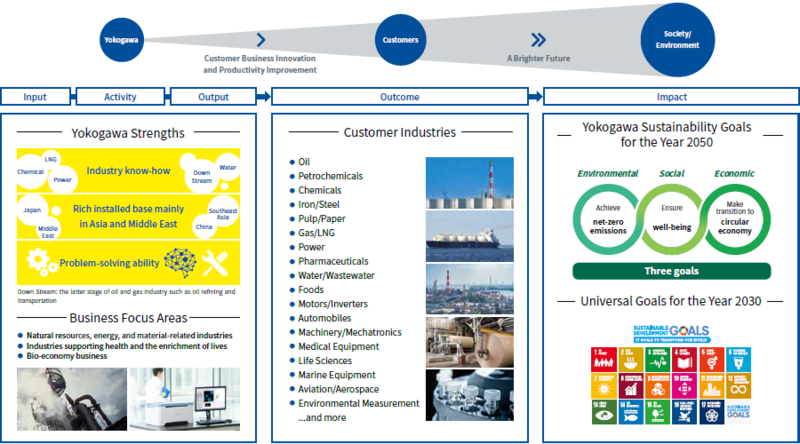 Based on the identification of business fields where Yokogawa is contributing to society and after considering global megatrends, the sustainability goals (Three goals) were developed to realize a sustainable society. To advance toward accomplishment of the goals, we set sustainability targets for 2030 in line with the Transformation 2020 mid-term business plan (TF2020). 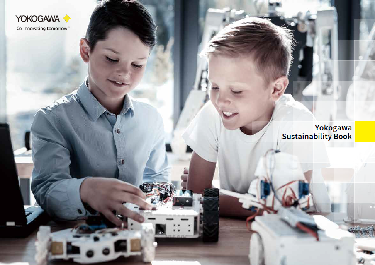 Yokogawa Sustainability Book, which is a digest of our contribution through business shown in this sustainability site, provides our vision for society in 2050, as well as the path by which we resolve issues and create value on our journey forward. In September 2015, the United Nations adopted the 2030 Agenda for sustainable development, which includes a set of the Sustainable Development Goals (SDGs). 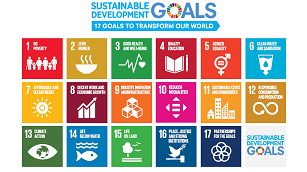 The SDGs, consisting of 17 goals and 169 targets, are universal development goals for ending poverty and hunger, protecting the planet, and ensuring prosperity that all countries and all stakeholders are encouraged to work toward. 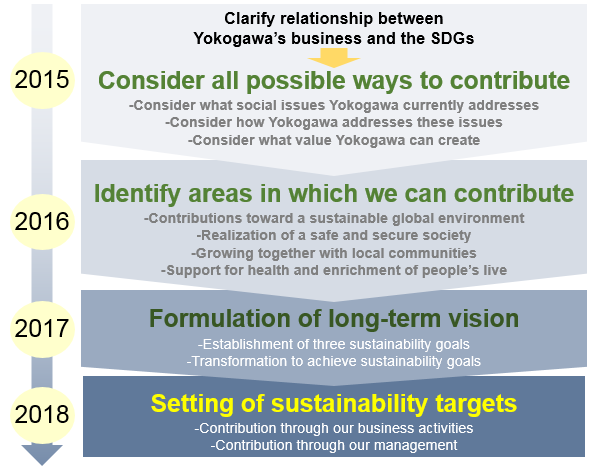 Yokogawa established sustainability goals (Three goals) for achieving sustainability.